Greetings from my home city of Boston where I'm spending the week with my brother friars at St. Anthony Shrine and visiting with family and friends. Earlier this morning I read a meditation from Fr. Richard Rohr, OFM, who by the way offers wonderful daily meditations. Fr. Richard commented on the popular hymn, O Holy Night, compsed in 1847 by Frenchman Placide Cappeau. He is especially taken by the phrase "and the soul felt its worth." His thought is that because the Son of God chose to become human, to become one of us, that we see the true source of our worth, a worthiness that is based on a gift given to us, the Incarnation, and not on our successes and accomplishments. Another spiritual writer, Fr. Ronald Rolheiser, OMI, like to point out that the Incarnation was not meant to be a 33 year experiment that ended with the Ascension, but rather a great mystery that began in Jesus and continues in us. If we can but allow our souls to feel their worth because Christ continues to act in through and with us, both we and the world would be transformed and we would indeed have Peace on Earth. In St. Francis Testament written at the end of his life he writes, "....and the Lord gave me brothers." You see Francis did not set out to found an order and recruit people to join it. He set out to do the Lord's work and people found there way to him. He received them as gifts from the Lord. His words challenge us friars to see one another as gifts, and given that we are all so very human that is not always easy. Here at St. Anthony Friary we just had the funeral of one of our brothers, Fr. Jim Jones, OFM. Jimmy, as he was known to us, was only 68 years old and had been ill with a heart condition for the past few years. That condition was worsened when he was mugged five years ago while taking a walk here in our generally safe neighborhood. He was also the seventh member of our community to die in the past 13 months. Ever since I came here Jim has been a positive presence in our community. He was not able to engage in much public ministry, though I did notice that priests, and other people as well, often came by and said they had an appointment with him. It was, I believe, the spiritual writer, Ronald Rolheiser, OMI, in one of his recent books who talked about the grieving process and about the fact that only after death is the totality of the gift that the person was in life able to be fully appreciated. I have found that to be true with all seven of my brother friars who have died this year, but today especially in the case of Jimmy. Our local bishop, Robert Lynch, came to the funeral. His reason for coming was to thank us Franciscans for the contribution that Jim Jones made to the diocese because of what he did for the priests here through spiritual direction. The homilist, Fr. John Tapp, from one of the local parishes, eloquently made the same point when he shared how Jim had been his spiritual director for 14 years. All of us in the community knew that Jim had done spiritual direction but never realized the extent of and the impact of his ministry. I mentioned above the fact that Jim was mugged a few years ago. 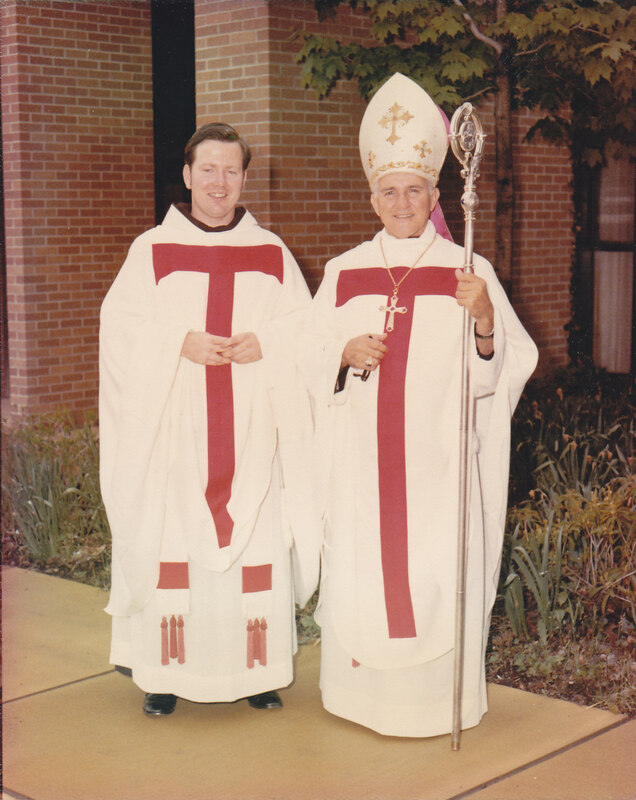 Both the bishop and Fr. Tapp talked of Jim's journey towards forgiveness of his attackers, something that gives a challenging witness to all of us. As Christmas draws near and we think of giving and receiving gifts I am thankful for the gift of Jimmy Jones and all of my brothers who have died in the past year. 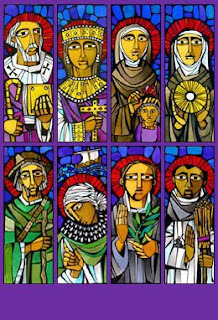 I also pray to be able to better appreciate gift of those now living--in my Franciscan community, in my family, and in the great and growing circle of friends with whom the Lord has blessed me. That is a real Christmas gift. A few weeks ago several readers of this blog asked my opinion on the new translation of the prayers for the Mass. I hesitated to respond because I wanted to wait and see. We are now into the second week of Advent and are getting used to (or not so used to) the new prayers at Mass so I thought that I might offer a few thoughts on the matter which I hope are helpful. Some explanations are in order. There is not a new Mass. The ritual of the Mass has not changed. What has changed is the wording of the prayers used. What many don't know is that in Rome there is an official Latin text from which all the languages of the world translate. In years gone by the criterion used for translation was what is called "dynamic equivalency". meaning that the basic meaning of the Latin was translated into English (in our case) or whatever other language. The Vatican in recent years has called for a more literal translation. Both have their advantages and disadvantages. Also, the English used until recently was a more colloquial or popular style. Some wanted a more rich or elevated language for worship. Again there are advantages to both approaches. My opinion on what has been presented to us is mixed. Indeed there is a certain eloquence to some of the newer expressions used and there are more biblical references because some were unfortunately removed from the earlier translation. At the same time I think that some of the texts are awkward and stilted and that there are words used which the ordinary person in the pew cannot understand. I know that we have a more educated laity and that they can fairly quickly understand that the word "consubstantial" in the Creed means "one in being". Today. however, on the Feast of the Immaculate Conception there was a reference to" prevenient" grace. Even I who am trained in theology had to stop and think about that one. I also think that the prayers that the priest uses could have been smoothed off a bit and still have been faithful to the Latin. What I do like is that there is more theological precision in a few places that never should have been missing. Before getting to those points I want to challenge people on both the left and the right who refer to this work as "going back." I have heard some say that they are finally getting back to the way that things should be and other lamenting that we are retrenching to the old days. Neither is true. 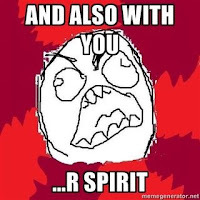 I say Mass often in Spanish and occasionally in Italian and those languages have always had things like the triple "through my fault" in the Confiteor and have said "And with your "spirt", and not "and also with you." In that sense we are not retrenching but just doing what everyone else is doing. 1. In the offertory prayers we refer to the bread, and later the wine, that we have received and which we now offer. This detail exists in the other languages but has not been used in English. The idea is that we offer back to God what God has given to us. 2. At the consecration we are invited to "take this all of you and eat of it" (the bread) rahter than just " ...eat it. This subtlety suggest that we are not possessing the Body of Christ, but simply partaking of it. It also suggests a communal sharing. 3. Several of the new forms for the dismissal rite make a clear link between the Eucharist and everyday life, eg., " Go in Peace and live the Gospel in your Life." One point that requires explanation is in the consecration of the wine into the precious Blood which is "poured out for you and for the many." This does not mean that Christ did not die for all, but rather suggests the masses or the multitudes who would accept Christ. He still died even for those who did not accept Him even if they have not taken Him up on it. In short I think we could have done better with this and hopefully some of the shortcomings can be corrected soon while still being faithful to the desired principle of a more faithful or authentic translation. A wise person once said that a translation is either faithful or beautiful, but rarely both. I still think that we need to strive for both. I was tempted to introduce Advent by offering a comment on the new translation of the Mass texts, but chose to wait until they have been in use for a while. Instead, some thoughts on the season itself. There is a great deal of sound advice in these words. For one thing they certainly make it clear that anyone who tries to predict the end times doesn't know what they are talking about. But how are we to prepare for the end times, for the coming of the reign of God in its fullness? I believe that the simple answer is to strive every day to be open to the many ways that the Kingdom of God breaks in upon us every day. In Luke 17:20-21 Jesus tells us that "The Kingdom of God is in your midst." What this basically means is that we who believe, insofar as we live the Gospel, carry the reign of God, the Kingdom within us right now. Yes, it won't come about in its fullness until the end times, but even now the peace, justice and love that characterize that Kingdom are in us and around us. This is indeed a big part of the source of Christian hope. It is easy to get bogged down and depressed by the evil in the world, and there is plenty of that. I think that a wonderful discipline for Advent, and Advent type of penance if you will, is to pray every day that our eyes might be opened to see the Kingdom breaking forth around us, and secondly to do our part to help build that Kingdom. We by our own efforts do not hasten the coming of God's reign, but insofar as we cooperate with God's grace to do the things that make the world a more just place in which to live, by helping to overcome divisions between people, by seeing that life is respected in every way and by caring for this planet that we inhabit we cooperate with God's plan to bring about that Kingdom. As Advent comes to an end and changes focus on December 17, looking to the coming celebration of Jesus' birth, we can truly have a wonderful Christmas if each one of us can say that we spent this Advent season preparing the world for His coming now and in the future and if we strive to let him be born into our own hearts today. We Franciscans are proud of the fact that St. Francis, near the end of his life, recreated the Nativity scene with live people and animals in the little Village of Greccio in the Rieti Valley of Italy. 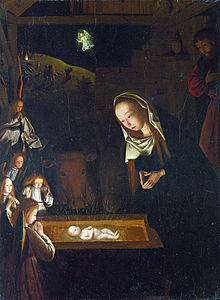 This wonderful celebration inspired the many Nativity scenes that we all have in our homes today. Interestingly enough however there was no baby in Francis re-enactment. Why? Because Francis, in whom it was said that Christ came alive in his arms, wanted those who were there and who later would hear of this event to see ourselves as the manger in which Christ is born over and over again. May He be born in all of our hearts this year. 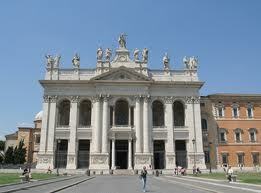 Today the Church celebrates what for many is an unusual feast, the dedication of the Basilica of St. John Lateran in Rome. 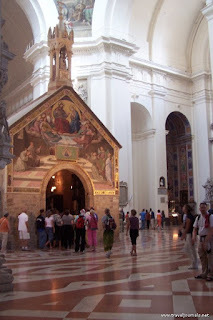 This basilica holds a special place in Church history, Franciscan history and in my own heart. Back in 1999 our Minister General, Fr. Giacomo Bini, OFM sent a latter to the friars of the order asking for volunteers to serve as confessors for the Jubilee Year 2000. The Roman basilicas are staffed by the diocesan clergy of Rome, but each one has a staff from members of different religious orders as confessors, the reason being that we can bring in people from around the world who speak different languages. We Franciscans have been assigned to the Lateran because it was there that Pope Innocent III approved the rule of Francis and his brothers. 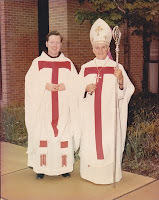 Ability to speak Italian as well as 15 years of ordination were two of the requirements to supplement the full time team of confessors there so I signed on and was accepted. I spent just about 7 months in Rome that year and it was a wonderful experience. From June of 2000 until early January 2001 I was hearing confessions there of people from all over the world. I also lived with friars from many different countries as well. As time went on the basilica continually intrigued me. Artistically it is eclectic with all sorts of art styles and most of the works truly beautiful. In time I realized that this wonderful house of worship was a microcosm of the whole Church. As you enter you see large statues, six on each side, of the twelve apostles. (See picture to the right above) There is a beautiful mosaic behind the main altar. On the left side one finds the confessionals--8 of them, where we Franciscans serve. In the middle is the main altar where beautiful solemn liturgies are celebrated. On the right there is a large side entrance, a gift shop and a starting point for guided tours. There are many small chapels on both sides including one with a Pieta', not the famous one by Michalangelo and not as beautiful, but significant because many people come there to pray for healing. In the Blessed Sacrament chapel to the rear of the basilica one finds the white "cathedra" or seat of the pope as bishope of Rome. Reflecting on all of this one sees that saints, sinners, seekers and doubters, the pope, bishops. priests religious and laity all gather here at various times. This is truly the Church. This is who we are, indeed even at simple, small parish Churches. The Church is indeed, as today's second reading says, made of living stones. In these early days of November we Catholics, and many other Christians as well, observe two feast that focus our attention on the next life--All Saints Day and All Souls Day. I find it interesting that in my case anyway some of the same people that I honored as saints in my own life I prayed for on the next day, because after all we are not certain and in some way all of us are both saints and sinners. Often, as we look to the next life, we don't stop to reflect on the fact that whatever happens in the hereafter is based on what we do now, on our response to the call to holiness which comes to us through our Baptism. What do we do now, in this life, to grow into sainthood. So how do we grow in holiness in this life? An obvious answer for starters is through prayer, and indeed without a strong relationship with the good Lord we don't grow in holiness. But prayer alone is not enough if we don't make changes in our life. This message came across loud and clear in a wonderful movie I saw the other day--The Way, starring Martin Sheen. In this movie the four main characters are making a pilgrimage, walking over several weeks a 500 mile (800 km) trek to the shrine of Santiago (St. James the apostle) de Campostella in Spain, departing from a small town in France. None of the characters have a highly religious motivation for making the journey, but deprived of the ordinary creature comforts of their everyday lives, thrown together with each other, and not always happily so, they are forced to confront their weaknesses and shortcoming which become unmasked by the stress of the journey. By the time they arrive at Campostella they are transformed, perhaps not ready for canonization, but transformed nonetheless as they fall on their knees at the shrine of the apostle. I highly recommend the movie which, to use the parlance of the day, is much more about spirituality than about religion, and hope that it might move you, as it did me, a bit closer to sainthood. Over the past few days the Vatican has issued a statement regarding a restructuring of the way that business is done between nations and by the banks. Also the pope gathered in Assisi with religious leaders of many different faiths from around the world to pray for peace, marking the 25th anniversary of a similar gathering by Pope John Paul II. I have been surprised by some of the reaction to both the document and the papal gathering, though maybe I shouldn't be. Some folks have criticized the Pope for praying with non-Christians. Granted that we need to be careful of a one religion is as good as another approach to things but what is so wrong about gathering with people of good will to pray. If people believe in God and wish to pray that is a good thing, especially if they are praying for peace. Remember the greeting of the angel at the birth of Christ--"Peace to people of good will", a line we repeat in the Gloria at Mass. The witness of a gathering like this also tells those who would distort religion to justify violence that they are wrong. Also I have had several friends remark to me that war will probably always be with us. This may unfortunately be true but I believe that Christians, and above all Franciscans, need to keep holding that ideal of peace before the world, and supporting efforts that do achieve some level of peace, or at least the cessation of violent hostility between peoples. As for the Vatican document on the economy I have heard two criticisms. The first may be somewhat valid in that it cites the lack of a deeper understanding of economic principles. Maybe (or maybe not) the Vatican needs to do more homework on the subject. What I don't get are those who say that because it was issued by a Vatican office and not the pope it is not infallible and does not need to be taken seriously. I'm sorry but the last time a pope spoke with infallibility was the 1950 declaration of the dogma of the Assumption. Does that mean that everything that popes have said since then, or that Vatican officials have said since then, is not to be taken seriously. I thought that as Catholics we should take it all seriously even when we disagree. Critique the statement to be sure, but do not dismiss it. I personally believe that while some parts of the document may be flawed from a technical point of view that it enunciates some important principles of Catholic social teaching that should not be ignored, and that indeed should be put into practice if we are to live in a more just and peaceful world. What think ye of all of this? 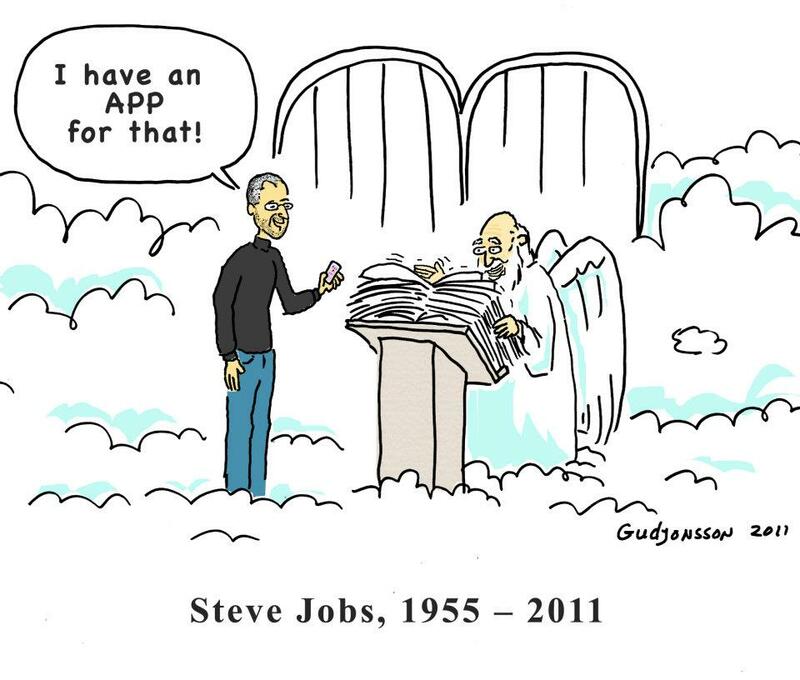 As one who strives to keep up with the advances in technology both to advance my ministry as a preacher and for personal enjoyment I was fascinated by the extensive coverage of the death of Apple founder and CEO Steve Jobs the past week. One of the blogs that I follow and that is referenced on this blog is Whispers in the Loggia, a site which puts out news of what's going on in the Church these days. Last week I noticed that "Whispers" carried an article from Osservatore Romano about this extraordinary man. You can click on the link here to see this article--Steve Jobs. Several things struck me about this article the most important of which is the fact that with the exception of world political leaders the Vatican does not usually reference the deaths of people outside the Church. In this case however there is a recognition that this man, who did not share our religious beliefs, was a true visionary who made a significant contribution to life in our world today. This is an example of something that I prefer to call "The Catholic vision of Life." What I mean by this is that when we Catholics are at our best (something which is not always the case) we are able to look out at the world and acknowledge the gifts that God has given to scientists, artists, politicians, etc. and affirm the results of their contributions as blessings from God even though many of them are not of our faith or even of no faith at all. At a deep level I think that this is because we look at humanity and creation in general as inherently good in spite of human sinfulness. With this belief in mind we can appreciate music, art, theater and scientific accomplishments as blessings and as ways of drawing us closer to God and each other. Now some might point out, and correctly so, that Mr. Jobs inventions as well as other advances in modern technology can lead us down the wrong path. That is where it is up to us, a creatures of free will to use these gifts properly. In this case this Franciscan advises that we keep the motto of the Jesuits in mind--Ad Majorem Dei Gloriam--For the Greater Glory of God. If we use our computers, smart phones, etc. with that in mind a lot of good can come of it. A second thought on Mr. Jobs and on the above mentioned article is the fact that he was called a visionary, a term often used for saints and mystics. While the Vatican was certainly not trying to canonize this man I find this term interesting because it gives praise to a faculty which I think that we humans don't use often enough--the gift of imagination. When I'm doing a parish mission and speaking to school kids I encourage them to take time to daydream (though cautioning them not to do so while in class), to use their imagination to think about possibilities for their life and to ask God to guide their dreaming. Steve Jobs is an example of what dreams can do and a challenge to all of us to strive to imagine a better. more just and peaceful world. 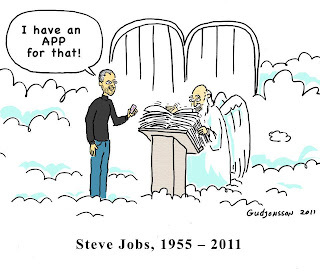 So lets thank God for the life of Steve Jobs and let us as well, as good Catholics, pray for the repose of his soul. A few weeks ago after celebrating Mass at St. Peter the Fisherman in Eagle River, WI I was stopped by someone who politely asked why the Mass there didn't move along more. I asked the person what they meant and the response was that after the readings instead of the next reader or leader of the responsorial psalm got up there was a pause. Likewise, this individual felt, that too much time was spent waiting after communion. I explained that these pauses are called for by the Church in its directives for celebrating Mass so that we could briefly meditate on the readings or on what just happened while receiving Communion. The person politely thanked me, shrugged the shoulders and walked away without, I think, really understanding why there should be silence there. I mention this incident because I believe that this response to silence reflects a deeper issue in our culture. We like to think of ourselves, among other things, as living in the age of communication, and in many ways we are. The TV and radio blare out opinions on every political and religious issue. We can listen to any kind of music that we like. Cell phones and computers put us in instant contact with the whole world, and any of us who want can express our opinion on whatever. I am part of this. I'm writing this blog and have have one of those fancy phones that does everything. But we pay a price for this. What is that price? For one we are constantly bombarded by noise. At baseball games loud music and events on the jumbotron scoreboard keep one occupied between innings, and many folks have to have something electronic attached to their ear at all times Likewise we are living at such a fast pace which is necessary in a way to keep up with all that we are bombarded with. Finally we have lost the ability to listen, to truly listen to one another and to God. A big part of the solution to all this is to engage in a discipline of silence, to take the time to be still, to quiet ourselves, to take a deep breath and contemplate all that is going on around us--the good the bad, and the ugly. We need this in our personal relationships, in our political debate and discourse and above all in our relationship with God. When people question why silence is part of good worship something is amiss. I was preparing some thoughts to post on the tenth anniversary of the tragic attacks of Sept. 11, 2001. I could not think of anything better than the joint statement of the seven United States Franciscan Provinces and the English province, so I invite you, dear blog readers, to click on the site below:. I welcome your responses. This weekend we celebrate the third and final summertime holiday--labor day. On Memorial Day we remembered our deceased veterans. On July 4 we celebrated our freedom, and on Labor Day we honor workers. But what are we as Catholics to make of this day when the unemployment rate is so high and our political leaders seem unable or unwilling to address the problem in an effective way. The teaching of our Church basically says that we are all workers. To be human is in some way to be a worker. From Pope Leo XIII in the 1890's right up to Pope John Paul II this teaching has been reiterated in various ways. Also through work we humans share in the ongoing process of creation by producing goods and services that enhance the quality of life on earth and which provide a means of living to all. The problem, of course, is that greed and self-interest, get in the way. Some goods and services do not enhance, but rather hinder, the quality of human life, and sometimes workers labor under unjust conditions. This writer thinks that the previous two sentences sum up the heart of today's problem, the blame for which can be cast at the feet of members of both of our political parties. I do not wish to promote or decry any one political leader in this blog, but I do believe that Christian concern for what is right, and not mere politics calls for me to point out some of the problems, as I see them, on this Labor Day. It was the greed of many banks and Wall St. firms, as well as the policies of our government and the high cost of the wars we have been waging that led to the economic downturn, and foreclosure crisis which is behind the high unemployment rate The last administration began it and this one has not been able to lead a return to prosperity, though we often forget the forces other than government are also responsible. The unwillingness of both political parties to bend, compromise and try to work together is also deplorable and adds to the problem. I have been working in Wisconsin this summer and decry strongly what Governor Scott Walker did when he took away collective bargaining rights from state workers. Now I will grant that some of the unions had demands that were unreasonable, but that's why negotiations get held. Our Church clearly teaches that workers have a right to organize and that employers are bound to negotiate in good faith. What folks on all sides forget is the Catholic principle of keeping the common good in mind. If we did this we wouldn't have the 'my way or the highway" mentality that permeates so much of our political debate. So, as we celebrate Labor Day and grill our burgers, brats and hot dogs, I believe that Catholic and Christian concern calls all of us to work together so that all are employed at honorable work, and that all receive just compensation for their labor. me since 1995. After a few summers I became aware of an ecumenical concert put on by Prince of Peace Lutheran Church here in Eagle River. 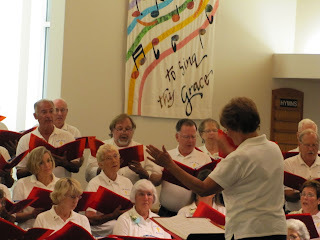 I joined the choir in 2005 and have sung each summer since then (except in 2006 when I had to stay in Florida to take care of health issues). People from many different churches and denominations come together to praise the Lord in song with music from the Great Awakening and Revival periods. This year there were 105 of us plus the directors. You can see some excerpts from the concert by clicking on the link above. Ever since the Second Vatican council promoted ecumenism I have been a strong supporter of any effort in that direction. Honest ecumenism doesn't whitewash our differences with other Christians but seeks to celebrate our common ground which is belief in God and in God's Son, Jesus Christ, with the hope that such common sharing will lead to greater unity and the overcoming of our differences. Right now I think that we are stuck in a time where great steps forward have been taken but we don't know just how to proceed from there. We certainly need to pray to the Holy Spirit to guide us and to open doors that we don;t seem to be able pass through right now. Right from the start i have not only enjoyed singing with POPS, but have been impressed by the deep Christian faith of its members. This was especially so in 2006 when I could not come to Eagle River. Not only did I receive prayerful support from the Catholics in Eagle River, Phelps and Land O'Lakes, but also from the members of the choir from many different churches. I will never forget that. As for the singing part of it I have always loved singing ever since Sr. Mary Magdalene "volunteered" me to join the boys choir at my boyhood parish of St.William's in the Savin Hill neighborhood of Boston. 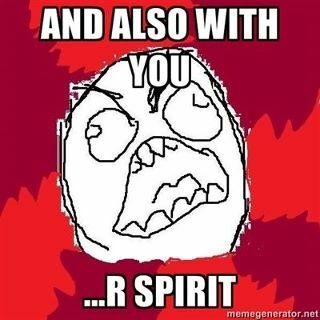 I was a member of the seminary choir and am told that I do well singing the Mass parts. Because I'm the presider though I don;t get to sing in the choir. POPS gives me a chance to do that. 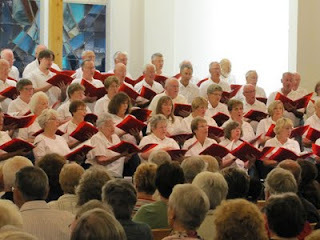 We practice every Wednesday evening for 6 weeks and have a dress rehearsal on the Sunday night prior to the concert. 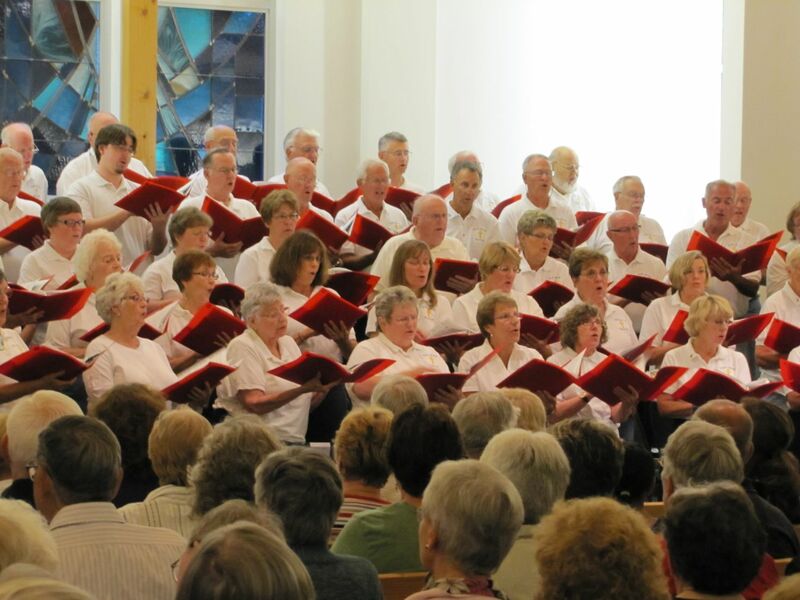 The concert runs for three nights (Tuesday through Thursday) and a free will offering is taken each night with proceeds going to local charities. This year we raised over $5000.00. I hope to keep coming back to POPS and hope that you my readers will seize whatever opportunity presents itself to join with other Christians in prayer, song or promoting works of charity and justice. He (she) has cancer. This sentence is so often whispered in hushed tones. Cancer takes lives and we don’t like to speak about it, yet millions of people have had that statement made about themselves. Five years ago I left Florida in June and was on my way to Eagle River for the summer. I had been biopsied for the third time for prostate cancer, but since the first two times were negative I was confident that this time would be as well. That was not to be. I was in Atlanta visiting friends as I journeyed north when I got the call from my doctor’s office telling me that I indeed did have cancer. Instead of continuing north I had to turn south again and return to Florida. I called Fr. Bob with the news that I would not be able to come to Eagle River that summer. Fortunately I had been going for regular checkups and cancer screenings and my prognosis for recovery and cure was excellent. After consulting with doctors about possible treatments I chose a radiation approach and things have been just fine so far, though I do get nervous every six months when I go for follow-up exams. The good news today is that cancer does not in many cases have to be a death sentence. There are millions of us in this country who are survivors and who will be participating in one of the many American Cancer Society’s Relay for Life programs. The Relay celebrates our survival but also works to find both better treatment and even a cure for cancer. St. Peter’s has a team in the Northwoods Relay for Life called Walkers with Soul. I will be joining several parishioners who will participate as cancer survivors The Relay though is not just for survivors. It is for anyone who wants not only to support them and also for anyone who wants to support the struggle for a cure. Please consider coming out to Northland Pines High School field on Friday evening, Aug 6 for the opening ceremony and for the beautiful luminaria ceremony at dusk where candles are lit in remembrance of those who have died of this disease and honoring the survivors as well. Anyone can join the team even if you are not a cancer survivor. Finally I urge everyone to get the cancer screenings that are recommended for your age and gender. Granted that there is squeamishness and humor regarding several of these tests, but remember THEY SAVE LIVES. This is so because most cancers can be treated with early detection. That was certainly so in my case. I might also add that care of our bodies and doing the things that prevent not only cancer, but other illnesses as well, is a Christian responsibility. God Bless and hope to see you at the Relay for Life. For more on the Relay just click below. One of the prefaces for weekday Masses says, "You have no need of our praise, yet the very desire to praise you is itself your gift." These words provide food for thought regarding the meaning of prayer and why we pray. While I pray every day (and hope you do as well) over the past few months several requests for prayer have captured more than the usual amount of attention for me. From the viewpoint of "outcome" the results have been very different. A few months ago a good friend contacted me and asked me to pray for a baby named Evangeline who was born prematurely and had several medical complications. There was a good chance that she would not make it. Not only did I set about praying for this child and her parents, I asked my Franciscan community to pray for her, and several communities of sisters as well. In addition to that many other friends have been praying for her While Evangeline is not entirely out of the woods she has made great promise and looks to be on her way. In her case it appears that our prayers have been answered. Certainly the whole story is eloquent testimony to the power of prayer. At just about the same time that I heard about Evangeline I was asked to pray for a 2 year old who fell into a swimming pool. I engaged the same people in prayer and the child's family and circle of friends spread the request for prayer. Unfortunately the child died. What are we to make of this? Both parents are good, practicing Catholics, people of strong faith. Was one prayer answered and the other not? This question, of course, as been on the minds of Catholics and others over the centuries. How do we explain this. I wouldn't begin to try to explain the mind of God, but I will say that our prayers are always answered. I'm sure that the family of the child who drowned in the pool continued to pray and found strength in their grief as a result of this. In fact I know this to be true. Deeper than this fact however is the need to understand why we pray and what is means to ask God for something. When we understand this it puts things into perspective. Why do we pray? The ultimate purpose of prayer is not to get God to do things for us, but rather to seek union with God, to grow in relationship with God. While I don't believe that God sits in heaven and thinks "Hmmm, I think that those folks on earth need a little sickness, death, tragedy and disaster," these things are part of life. They remind us that life is fragile and that we are finite. Because of this they open us to the need for God. Our illusion of total self-sufficiency is shattered by these things. They open us to God then and our first instinct, which is a good one, is to ask God to take away our pain and suffering, or that of someone we love. It is easy to believe that our prayer is heard when we get the desired outcome. When we do not we need to understand that if the ultimate goal of prayer is union with God, then God will indeed be with us when we open our hearts with our desires. What happens then is that God gives us strength and comfort when we don't get the results we want. God will always be there. God's promise to us is not that if we have faith all of our problems will be taken away, but rather that we will never be abandoned. I found this to be true back in 1992 when our family got word from the doctors that my mother would die of cancer. She had battled for 5 years and during that time we constantly prayed that she would live. When we found out otherwise we were sad of course, but we found that God gave us all great strength, and my mother went to her death peacefully knowing that she was loved by her husband and three children. The whole experience brought us closer to God. As that line from the Mass preface that I quoted at the beginning says God does not need our praise, our prayer, but we need God. Hopefully we go to God everyday to open our hearts in prayer and to present whatever is there--a request, a plea for forgiveness, a prayer of praise and adoration, or one of gratitude. If we do that we will draw ever closer to God and be ever more mindful of God's presence with and among us. 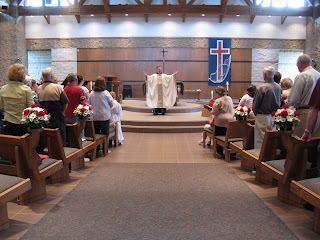 I celebrated Mass this morning at St. Peter the Fisherman in Eagle River, WI. Today is the feast of a great Franciscan saint, St. Bonaventure. I asked the 20 or so people who were there if they knew anything about Bonaventure. Only three raised a hand. That experience reminded me that this great man and doctor of the Church is so well known in Franciscan circles, but not outside of it, so I thought that I would present a little about him on this blog. 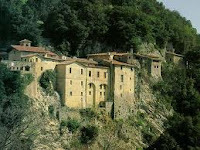 St. Bonaventure hails from a small town in Italy called Bagnoreggio in 1221. he died in 1274. After entering the Franciscans around 1240 he was eventually ordained, became a professor of theology at the University of Paris and was a contemporary of Thomas Aquinas. He became Minister General of the Franciscans and eventually was ordained a bishop and became a cardinal. He was in the beginning with God. All things came to be through him, and without him nothing came to be. What came to be through him was life, and this life was the light of the human race; the light shines in the darkness, and the darkness has not overcome it. The same thought is expressed in the letter to the Collosians (See Col, 1, 15-16). Basically what this tells us is that in the mind of God Christ is the first creation in the mind of God and that Christ was ordained to become human right from the beginning, even if humans had not sinned. How different this is from the thought the Jesus was a type of divine intervention made necessary by sin. Bonaventure and later Franciscan theologians like Scotus don't deny sin and the need for redemption. They stress that the coming of Christ is the center and high point of human history, the punctuation mark on it that God planned from the beginning. These thoughts are rooted in Scripture and also in several theologian of the early Church such is Iranaeus of Lyon. In this theology Jesus was not sent to get crucified. he was sent to proclaim the reign of God and to love us unconditionally. When that love met sin the cross resulted. Bonaventure sees the Cross as central and as the ultimate expression of God's unconditional love. Creation itself reflects Christ in whom all is created and the cross in which all discord and opposition are overcome. Another aspect of Bonaventure's thought is being looked at today in light of our ever growing understanding of the universe. He stresses not only that all is created in Christ, but that all will return to Christ, very much in line with our sense of the expanding and contracting universe. After a whirlwind of travel in the past few months I've settled into my summer ministry at Eagle River, Phelps and Land "O'Lakes here in Wisconsin. My celebration of my fortieth anniversary of ordination has become a kind of moveable feast with the three parishes here all graciously celebrating this with me. As many of you know my summer times here are special to me for several reasons--wonderful people, a chance to experience parish life, a chance to sing in a choir and to offer some adult faith formation are at the top of the list. It is a blessing that I have been able to be in touch during my travels via this blog and Facebook especially. As I've done that I've heard several comments about internet use--friendly kidding about being the "techie friar", accolades from people who urge me on with this, and while no one has said anything negative to me about my internet use I have run into folks who express concern or fear about our modern high tech world or who say things like "that stuff's not for me." I would like to address these concerns. The internet and the social networking tools that have arisen with it are media, forms of expression and communication. As such they are morally neutral tool. You can find everything from the evil to the trivial right on up to the amazing and edifying. I strive to fit into the latter category. Over the past two months I have brought followers into things such as my experience in Assisi, my fortieth Anniversary of priesthood and offered several reflections. On Facebook I share interesting places and experiences that I have had. What has been really amazing to me though is the opportunity to connect in prayer. Now I don't like these requests that come out of nowhere and try to make you feel guilty if you don't pass on an e-mail about some situation. That having been said I have had the opportunity to pray for several situations passed on to me from good friends that I might never have learned about had it not been for the social networking that goes one. 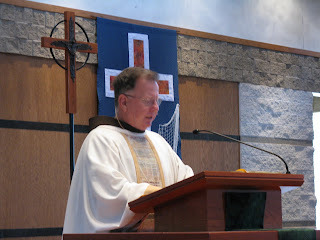 Just this morning I said Mass for a woman in Arizona who is facing very grave illness. There have been similar request during this time whether I was in Assisi, Florida, Michigan or now Wisconsin. This past Sunday we celebrated Corpus Christi, the Solemnity of the Most Holy Body and Blood of Christ.his was a feast the Eucharist to be sure, but also a feast of the Church which is the Body of Christ. To me the social networks, with all their capacity for triviality or even evil, are also a means of allowing the members of the Body of Christ to stay in touch, to pray, to teach and to affirm and support one another in living our faith. I say a big Amen to that. Pentecost:Too Good to be True? This Sunday the Church celebrates the feast of Pentecost. Pentecost is also a Jewish feast. The word simply means "50 days" in Greek, 50 days after Passover, and fifty days after Easter. We celebrate the descent of the Holy Spirit on the apostles and with that the birth of the Church, though it can be said that the Church was born on the Cross or even at the Annunciation. I won't enter into debate over that issue. There is truth in all 3 approaches. Suffice it to say that it is one of the three major feasts of the Church along with Holy Week/Easter, and Christmas. For the former two feasts the Churches are full, drawing even those who do not come to Church regularly. Why is this? While there are probably many answers for this I think that deep down even those of us who believe find it too good to be true. We can believe that God took human flesh in Jesus, or that Jesus rose from the dead,but Pentecost calls us to believe that the Holy Spirit not only descended on the apostles, but that the Holy Spirit dwells in you and me, and brings the mysteries of Christmas and Easter to life in us over and over again. I think that somewhere deep inside of us we like to keep God at a distance-in past history, in an ark, in a temple, in a Church, in the tabernacle. Now don't get me wrong, it would be heresy to deny the presence of god, of Christ, in the above mentioned places. The point is that we can more readily believe in those things than we can believe that God, through the Holy Spirit, dwells in me, in you, in the Church as the Body of Christ. When this happens we get caught up in externals, in what direction the altar should face, what language music and what to use. Now I don't deny that Eucharist and the other sacraments should be celebrated properly and with the right combination of reverence and joy, of common unity blended with local cultural expression, but when we put so much energy and even anger into this discussion we are not a calling on the presence of the Spirit among us. When we put too much emphasis on the business affairs of the Church while the world around us is torn by war, violence and injustice, we are not attending then to the Spirit dwelling amongst us.We argue that we are not worthy. Of course we're not. The Spirit comes as gift in spite of our unworthiness. The challenge for us is what do we do with the gift. The answer is that we allow the Spirit to work in us, each according to his or her gifts, to make a difference in the world, through prayer, action and witness, and at the same time to build a vibrant Church, not one according to our own likes and tastes, but the Church that the Spirit is striving to build through us. Let us make our own on this wonderful feast the ancient prayer of the Church--"Come Holy Spirit, fill the hearts of your faithful. En-kindle in them the fire of your love. Send forth your Spirit among us and renew the face of the earth." I invite you to click on the link below for a rendition of the traditional hymn, Veni Creator Spiritus, sung in Latin with English translation. It beautifully expresses what this Feast is about.